Richie Havens at the 40th Anniversary of Woodstock at the Bethel Woods Art Center in Bethel, New York. 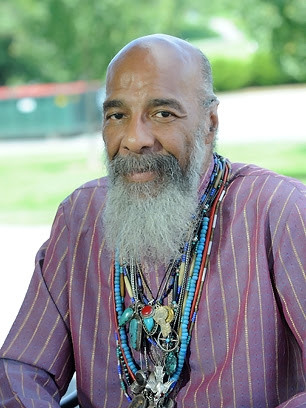 Richie Havens' ashes will be scattered at the site of Woodstock, the iconic festival he opened in 1969. The folk singer died in April at age 72 from a heart attack. The ceremony will take place on August 18th on the former location of Max Yasgur's upstate New York farm, which hosted the historic festival and its 400,000 participants; it is now home to the Bethel Woods Center for the Arts. According to Havens' official website, the "day of song and remembrance" will require a free ticket for admission. More details will be released soon. Havens wasn't supposed to be the first act to perform at Woodstock, but with other artists stuck far away in traffic and the concert already running three hours behind schedule, organizer Michael Lang urged the folk singer to take the stage. "I thought, 'Jeez, they're gonna throw beer cans at me because the concert's late,'" Havens wrote in Rolling Stone on the 20th anniversary of Woodstock. "So I did a little fast talking, a little rap, and then I did a nearly three-hour set, until some of the others finally showed up." With Havens running out of material, he improvised a song based on the spiritual "Sometimes I Feel Like a Motherless Child." He later recalled, "That word I kept hearing while I looked over the crowd in my first moments onstage. The word was freedom."